USATT has a new ratings portal. Prepare to be let down. Let's do a point-by-point comparison. I'm using Chrome for this, but I checked it out on Explorer as well and seemed to get the same results. Feel free to test it yourself. In the old version, it showed what date the ratings were through, and listed tournaments before that date that were not yet processed, and even gave the reason why. It also listed the ratings by year so you could click on the year and choose any tournament from that year, with the tournaments listed chronologically, even listing the number of players and matches in each one. The new version has none of this. Want to find the results from a specific tournament? You can't. (My first reaction to this was You've Got to Be Kidding!!!) Want to see what tournaments were processed? You can't. In the old version, if you wanted to look up someone's rating, you put in their last name, hit enter, and chose the person from the alphabetical list. In the new version, you also put in their last name, but if you hit enter, it doesn't work. You have to manually hit submit. The new version also has a field where you put in state, but if you do, it ignores the name you put in and gives you the entire alphabetical listing for that state rather than just those in the state with that last name. Also, the old version had the name field at the top of the screen. Now, unless you have a large screen, you have to scroll down to it. The old version had the Customizable Membership Lists, which I use regularly. With that you could create just about any ranking list. You could chose the age (under or over); gender; choose only players who played since a certain date (or before); only those over or below a certain rating; by USATT members only or all past members; and from specific states, USA only, or all. Now you can barely do any of this. In the new version, you cannot narrow down the selection by multiple criteria, and you have to use the ages they give. For juniors, you can only choose under 18 or under 20; for seniors, only in five-year increments. Or you can choose just men or women. You cannot choose these as USA only, or by state. You can't create an age ranking list by state, for example. If you want a simple ranking list of, say, top men, that was easy in the old version – and you could do it by USATT members or not, USA only, or by state, age, gender, etc. In the new version if you click the handy Top Men Singles Button, you get as the #1 player Thomas Keinath of Germany. The #2 is Ilija Lupulesku, who hasn't played a USATT tournament in four years. Meanwhile, USA Team Member Timothy Wang is left out, presumably because his membership is currently expired – and there's no option to list non-members. If you want a listing of only top USA men or women who are active (say, played in the last year) – good luck. You can't. The next field is the Ranking Group, which I already covered above. But when I actually tried out each field, a number of them didn't work. The Men's, Women's, Under 18, and Under 20 fields wouldn't work, but after I'd tried them several times, the Under 18 and Under 20 suddenly worked – but not the Men's or Women's. One problem is that when you release on a ranking category, you assume the page will bring you that list, but it doesn't unless you also manually hit Submit. (Again, Enter doesn't work.) Also, the next field, Season, caused problems as nothing worked unless you chose a season – but there was only one season to choose, 1994-2014. The problem is that the one choice there kept disappearing, and to get it back I had to choose another category, and then it would reappear. Below this is the Search for a Member field, which I discussed above. If you want a state listing, you have to use the Select State field, which doesn’t make sense – why would you go to Search for a Member fields to find a state listing? In the old version there was a listing of each state, and you just clicked on the state to get an alphabetical listing. Or you could add criteria for this in the Customizable Members List. Anyone care to create a list of, say, Under 14 Boys in Maryland, or any other age listing by state? (Preferably only ones who have competed in the last year?) Or just about any other ranking list that involves more than one criteria (and in most cases, even one)? You can't in the new system. I'm sure the ones who put this together will say they plan to fix these problems. But why would we switch to this when IT'S NOT READY YET??? It's not ready for prime time, and is a massive downgrade from what we had before. It's like going from Tenergy to sandpaper. Didn't anyone from USATT test it before they decided to go live with it? I strongly urge USATT to go back to the old portal until the new one can match what we had before. Former USATT President Sheri Pittman Cioroslan is doing an article every day during the last 100 days of Adham Sharara's ITTF presidency. I linked to the first nine on Monday (I'd been linking to them earlier as they went up), and here are three more. Twelve down, 88 to go! Here's where you can vote for Lily Zhang and Tahl Leibovitz as USOC Athlete of the Month. Lily has some tough competition – the voting shows the leaders are a triathlete and someone from track and field. Tahl's up against athletes from triathon and diving who currently lead the men's voting. These interviews are mostly with makers of non-inverted surfaces: TSP, Avalox, Dr. Neubauer, Xiom, and Re-Impact. Here's the article and video (1:34). There's a showing of the movie in my area this Friday at 7:30PM that I'm planning to see. I'll probably blog about it next week. Here's the video (2:06, starts with 30sec commercial), where she plays doubles with actor Ansel Elgort against Kathie Lee and Hoda Kotb. Here's video (1:52) of kids at the recent ICC club fundraiser showing off their piano skills. Who will win Tech City's Ping Pong Fight Club? Here's the article. Why I'm Bad at Ping Pong – Illustrated! 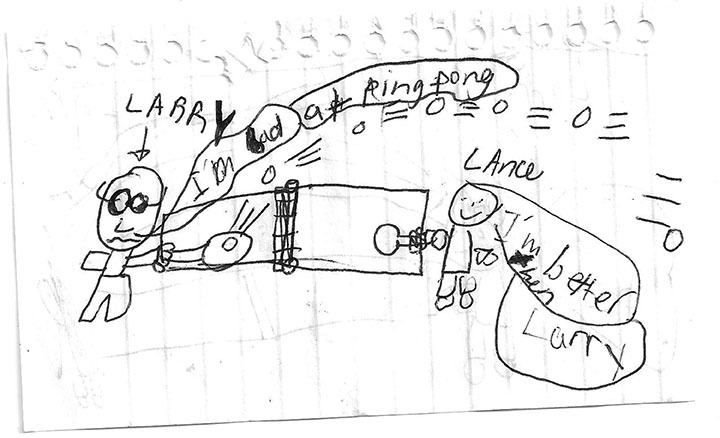 Here's a drawing by Lance, a 7-year-old student of mine. I leave for my niece's wedding in Oakview, CA, at 7AM on Thursday morning from Dulles Airport. I won't get back until early Monday morning, and then I have to run over to MDTTC for our Spring Break Camp (Mon-Fri, 10AM-6PM). So my next blog and Tip of the Week will be Tuesday, April 15. My niece wanted to arrange a series of fun activities during the three days of wedding activities, and asked if I'd put on a table tennis clinic. So I'm bringing my table tennis stuff, including a half gross of balls in a box for multiball. I'm even bringing a few soccer-colored balls so they can see spin. No one else in my family (including the ones marrying into ours) plays seriously. There's also a wine tasting (I'm a non-drinker, alas), I think hiking, and who knows what else. USA's Barbara Wei, who practically grew up at my club, MDTTC, as a top junior (and as a member of the USA Cadet and then Junior Girl's Team) has made the Final Three in the ITTF's Voice of Table Tennis Contest. Here's your chance to vote for her! But so has USA's Adam Bobrow. The third contestent is David Wetherill, who I believe is from England. Voting ends on Monday, so vote now! One of my students (who asked to stay anonymous) thought I should ask readers the following question: What do players imagine shadow practicing when, say, at the office and need to work off some energy? I know for me it's forehands, both loops and smashes. I even keep a weighted racket by my desk, which I use both to work off energy and sometimes as a racket when I'm thinking about a technique while writing. One change: when I was younger I also shadow practiced moving side to side. These days it's more stationary forehands, alas. However, I also think about backhands. Many years ago while sitting on the subway no doubt on the way to some table tennis event I was thinking about backhands. Suddenly and spontaneously I stroked a backhand, smacking an elderly women sitting next to me in the face. I was very apologetic and she took it pretty well, but I was pretty embarrassed. I bought the weighted racket in Osaka, Japan at the 2001 World Championships; here's a picture. Butterfly used to sell this very model in the U.S. back in the 1970s. (They also had a thinner metal version.) I bought one around 1979, but someone stole it at some point, which is why I had to buy another in Japan. I don't think they sell them in the U.S., alas. (I just did a search and couldn't find any.) If they did, I'd recommend them to my students. I've seen some players make their own by gluing weights to a racket, or even gluing two rackets together. You can get quite a workout with them, and they build up arm strength while you work on your stroke. You don't want to use them in an actual rally, however, as that would mess up your timing. Here's an article, Shadow Practice for Strokes and Footwork. Here's a shorter one, Shadow Practice Your Shots. Along with serve practice and mental training these are the three quickest ways to improve - call them "Get Good Guick" schemes. (To the spelling police: the triple G spelling was intentional.) It won't make you good by themselves, but they'll definitely expedite the process. How are you doing today and I hope you're well? My name is Mr. Michel Piaf, my Wife and I are looking to hire a Table Tennis Instructor for our son who's coming over for holidays to get some rest and ready to learn Table Tennis, Since he's going to have nothing doing while he's there we decide to hire him a Table Tennis Teacher to take him through since Table Tennis is he's only sport he loves so very much and wants to get to learn and join school team. His name is Glen and he's is 14yrs old. If you are available and ready, kindly get back to us with your hour rates and hopefully an arrangement can be made. What city you located now? Here's a video (7:59) that compiles many of the greatest and most hilarious exhibition points ever played. reaction to stress, or a side effect of the effort going into the shot. looping, improper use of the tongue can be disastrous. less rigid inside the mouth, believing that this maximizes balance. timing and training of the tongue. into the shot he uses his legs, hips, waist, shoulders, arm, and wrist. throws his arm into the shot. player throws the upper body and arm into the shot. 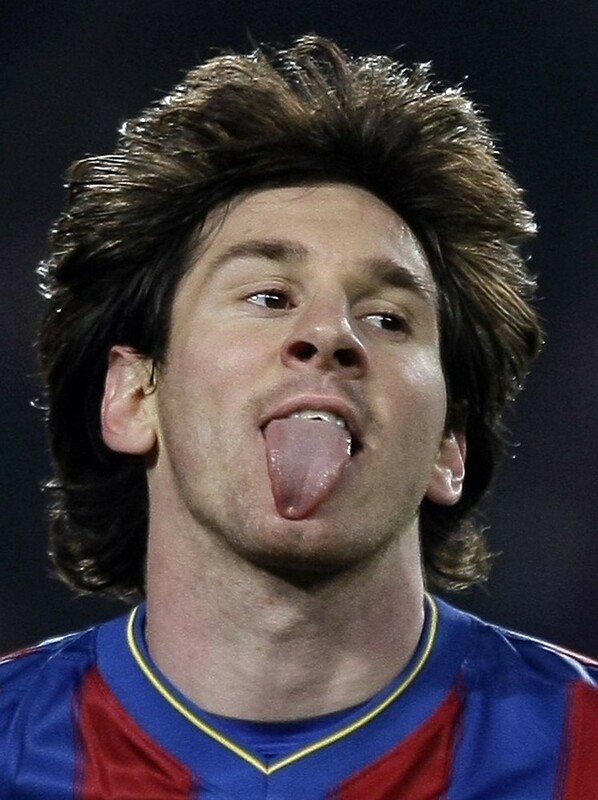 more physical training, including more tongue exercises. into the shot - note how the lower lip is pulled in over the tongue. stretches on the MDTTC sofa. fishing. Later I gave a probably-too-long lecture on return of serve. practiced for over an hour. short - you attack them, mostly by looping); and How to read spin. That's what Dimitrij Ovtcharov said after winning the German Open. Here's the article. Here's a video (3:14) showing Tony as he prepares for the College Nationals. Never Give a Server What He's Looking For. Table tennis clubs are full of players with poor technique. And there's nothing wrong with this, if the player doesn't care, or at least doesn't put a high priority on it. There are also lots of good players with poor techniques, though few of them get beyond good and become very good. That's subjective, of course; I can name a number of players who have reached 2200 and 2300 levels despite poor technique. The key is they developed a game around that poor technique, and didn't get good because of the bad technique, but in spite of it. Here's comes the part a lot don't realize, and it's a three-parter. 1) You will not reach your potential unless you develop good technique. This doesn't mean everyone plays with exactly the same technique. There are some techniques where there's clearly a "best" way, and there are others where there are multiple options. Often it depends on the rest of the player's game. Some players have developed such unorthodox games that what is proper technique for others might not be proper technique for them. But that's a rarity. Almost always, to reach your potential, you need to develop good technique. 2) Anyone can develop good technique. I don't care how poor your current technique is, you can fix it, and have good technique. This doesn't mean you'll have great technique - that's almost impossible once you've developed bad habits. But you don't need perfect technique in this sport (except in most cases at the highest levels), and good technique will take you pretty far. 3) It will take lots of time and effort to develop good technique if you currently have bad technique. You'll also lose to a lot of players if you continue to compete while changing your technique. (I usually advise against that.) It takes a lot of saturation training to fix bad technique, and you'll probably need a coach - which usually costs money. But it's a one-time fix, because once it's fixed, it's fixed for a lifetime, as long as you continue to play regularly. So, do you have bad technique? It's your choice whether to keep it that way, or make it a goal to fix that technique once and for all. Here's a short article with the final ranking of the Chinese Team Squad (men and women), with links to numerous videos of them in action. Here's the article, where he says the speed dropped some. Unfortunately, the article doesn't say which of the new balls they were using. There are at least three ITTF approved plastic balls. Leaving that out sort of makes the article somewhat less useful, and I hesitated in including it here. Here's the article from USATT. Here's the Feb. 2014 National Collegiate Table Tennis Newsletter. Here's video (2:45) of a preview of the coming-of-age comedy coming this summer, starring Susan Sarandon and a break dancing, rapping and ping-pong playing 13-year-old. Here's video (6:52, with time between points removed) of Denmark's Michael Maze's (world #28, but formerly #8) win over Germany's Dimitrij Ovtcharov (world #6) in the semifinals of the European Cup this past weekend. (Ovtcharov defeated teammate Timo Boll, world #8, in the semifinals - they were the top two seeds, so presumably one of them was upset in preliminaries?) Here's video of the other semifinals (5:09) where Portugal's Marcos Freitas (world #15) defeats France's Adrien Mattenet (world #52). And here's video of the final (4:54) where Freitas defeats Maze. Here's video of the rally (48 sec, includes replays), which took place at the 2014 Europe Cup this past weekend. Here's the article from the San Jose Mercury News, "She may be in a wheelchair, but Cindy Ranii is a ping-pong powerhouse." Here's video (40 sec) of an exhibition in a shopping mall, with lots of lobbing and changing of sides during rallies. Here's the racket I lend out to my opponents. Three Reasons Players Miss Against Deep Sidespin and Topspin Serves. I recently ordered three of the new Palio seamless plastic poly balls that the ITTF has ordained shall replace celluloid balls in July of 2014. I ordered them from Eacheng.net, and they came in on Friday. I brought them to the club and about ten different players tried them out, mostly top players. The consensus was pretty much the same as others have said. Hopefully the ITTF will work to fix these problems, even if it means delaying the change. Here's what we found out. Though I ordered them from Europe, they are made in China, and come in Chinese packaging. For unknown reasons, the balls are closer to 41mm than 40mm. Why didn't they keep them the same size? I can't measure them accurately but holding them side-by-side makes the size difference obvious. Because of this they also appear to be heavier. They are harder than celluloid balls. The contrast is obvious when you press your finger into one and then into a celluloid ball. They are faster than celluloid balls. We dropped them and a celluloid ball from about three feet up over and over, and every time the new balls bounced nearly an inch higher. They sound cracked when you hit with them. They are harder to spin. This might simply be due to the larger size and weight. One player thought this would favor hitters. I have a feeling it might simply favor bigger, stronger loopers, just as going from 38mm to 40mm did while pretty much killing the hitting game at the higher levels. Most players didn't like them, but enjoyed playing with something different. One 2300 player thought players would have no problem adjusting, but most didn't think they'd be accepted because of the cracking sound and the difficulty in spinning them - though that could be fixed by simply making them 40mm. I think players would adapt to the lower spin, but that cracked sound is not so good. According to John Olsen (who hit with earlier versions at a Stellan Bengtsson camp, they are better than the earlier versions. I've been having knee problems for several weeks. Right now they don't really hurt, but I feel like I'm playing on a slippery floor every time I try to move, even though I'm playing on grippy rubberized red flooring. I feel like I'm just tottering about. Even simple moves like stepping to the left or right to block or stepping in for a short serve to the forehand leave me slightly off balance. Trying to move to attack with my forehand (which is central to my game) is turning into a distant memory, and I mostly just wave at balls to my wide forehand. Again, it's as if I'm playing on a slippery floor. For the first time in decades (except when playing on slippery floors) I don't have that feeling that, no matter what's happening, I can turn it on at any time. I have no idea when or if the knees are going to get better. It's not too bad when I hit with beginning players or feel multiball, but when I hit with stronger players it's a serious problem. I haven't seen a doctor, since I figure what's the point - they'll just say to rest them. Am I missing something? It's also sold at Amazon in Kindle format, and a print version will be sold there sometime soon. (It was supposed to be up already, but I'm told it might be a few more days or longer.) It's my first novel, though I also have Pings and Pongs, an anthology of my best sold short stories, along with five books on table tennis. It is 1969, at the height of tensions between the U.S. and the Soviet Union. Neil, 13, badly wants to be someone. Instead he's stuck as a sorcerer's apprentice for Gus, the "meanest sorcerer in the world.” Gus creates a magical talisman to spy on the Soviets, but instead it spies on them and sends text into space. A Giant Face in the Sky shows up, reading the text. Since whoever gets to the Face first can lob spells down and have the world at their mercy, the Race to the Face begins. The Soviets invade the U.S. in their attempts to kill Neil, who is prophesied to defeat them. A floating, talking meteor assassin named Buzz becomes Neil's companion--but in one week, Buzz must kill Neil. President Kennedy puts together a motley crew that includes Neil, Gus, Buzz, a dragon, the god Apollo, a 2-D sorcerer, and the sorceress Jackie Kennedy. Can they make it to the Face before the Soviets, and before Buzz kills Neil? Here's the article: Service Receive Secrets From Japan. The key point is that you should be aware of the axis of rotation on a spin serve, and either contact the ball on the axis (so the spin doesn't take on your racket much) or use the spin. In Japan, they apparently call the banana flip the "Tikita" or "Chiquita" flip. Here's video (9:52, with time between points removed) China's 16-year-old whiz kid Fan Zhendong defeating Germany's Dimitrij Ovtcharov in the Men's Singles Final at the German Open this past weekend. Here's video (8:40) of Fan defeating Vladimir Samsonov in the semifinals. The week before at the Polish Open Fan became the youngest ever Men's Singles Champion at a Pro Tour event, so this week, one week older, he became the second youngest as well? Meanwhile, here's video of a great point in the semifinals (39 sec) between Ovtcharov and Timo Boll. Here's another nice point where Samsonov does an around-the-net return against Sweden's Kristian Karlsson in the round of 64. Here's a video (7:40) of a Chinese news show that features Fan in training. It's in Chinese, but it's still interesting to watch. Here's video (3:10) of Richard Perez capturing the first 4-table Open Championship with a comeback against Greg Robertshaw. Scream (video, 59 sec). I like his backhand counter-hitting. What do you do when you absolutely, positively have to win the next point? How do you serve and follow, or receive, when the game is on the line? Note that this is somewhat of a trick question as you should be using these plans throughout a match, often to keep you from actually reaching a point where you absolutely, positively have to win the next point. And if you do reach that point, you should have tried out so many of these plans that you'll know which ones work. Here are my "go to" plans, the secret weapons I pull out when I absolutely, positively have to win the next point. Short forehand pendulum serve with a big downward motion that looks like backspin, but actually has sidespin-topspin. With a subtle snap of the wrist at contact, the inner part of the paddle moves up on contact, creating topspin. Opponents pop it up or return it weakly over and over, setting up easy smashes and loop kills. Deep breaking forehand pendulum serve into the backhand that jumps away from the opponent. If the opponent doesn't have a good backhand loop, or can't step around and forehand loop it (and still cover the wide forehand on the next ball), then this serve sets up many easy smashes and loops. Because it goes so deep I have time to get my forehand on the next ball over and over. Heavy no-spin short to the middle. ("Heavy no-spin" means that I fake lots of spin but put no spin on the ball.) As long as I keep it very low to the net, I almost always get a relatively weak ball, usually a push, that goes deep, setting up an easy loop. 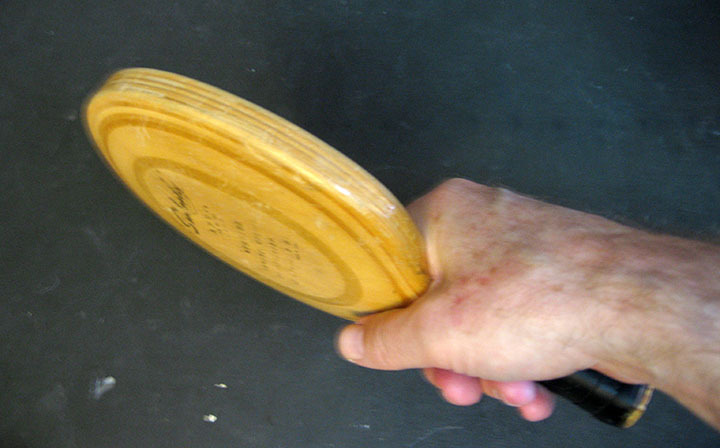 It comes back with less backspin than if I served backspin, and flips off it are usually softer than off a sidespin serve. Forehand pendulum serve with heavy sidespin-backspin, short to the forehand. As long as I hang back toward my backhand side this tends to get returned to the forehand or middle, setting up an easy forehand loop. Fast no-spin to the middle (opponent's elbow) with my forehand pendulum motion. The opponent has to decide quickly whether to return forehand or backhand, has to swing harder than usual to overcome the no-spin (as opposed to a fast topspin serve, where the topspin makes it jump off their paddle), and they usually end up returning it into the net. If they do return it, they are out of position (from covering the middle), and so usually open to an attack to the wide corners. Forehand tomahawk serve short to the forehand. Most opponents make weak returns to my forehand, setting up an easy forehand loop. Forehand tomahawk serve deep to the forehand. This works against players with weaker loops. Since it breaks away from them, they often lunge for the ball at the last second, which means they both lose control and lower their racket (meaning they will lift the ball too much, usually off the end). Against short backspin serves either drop the ball short or quick push wide to the backhand, sometimes deep wide to the forehand. In either case I try to aim the ball one way and change directions at the last second. This is effective on both short and long pushes. On short pushes, I generally aim to the backhand, and at the last second drop it short to the forehand, where players are generally a little slower reacting to. On long pushes I mostly go long to the backhand, often aiming to the forehand side until the last second. But since many opponents anticipate this, I can get a couple of "freebies" in many games by switching directions at the last second and going to the forehand. Against someone who consistently serves long, just loop the serve, but focus on spin, depth, and consistency. Against a forehand pendulum serve (or other serves with spin that breaks away from me on my backhand) I have a pretty good forehand loop, and I see the serve coming, even under pressure I can often step around and loop it away with my forehand. I would normally only do this against a player who not only predictably serves long, but doesn't have much variety on his serve. Against someone who has great spin variety looping too aggressively is usually too risky. This video (1:06) seems to be a preview of a historical Korean table tennis movie. Can anyone translate what it's about? Added bonus - go to 0:32, and you'll see two Chinese women playing doubles on the far side. The one who starts on the right (while the other woman is hitting the ball), and then moves to the left is Gao Jun, former Chinese star (world #3, 1991 world women's doubles champion) who emigrated to the U.S. in the mid-1990s and was USA Women's Singles National Champion nine times. While we're on the subject of table tennis movies, here's an article I had published in Fantasy Magazine three years ago on fantasy table tennis in movies and on TV. Nominations are now being accepted for the 2011 George M. Steinbrenner III Sport Leadership Award, which annually honors a member of the U.S. Olympic family who has made outstanding contributions to sport. Yes, now you can stretch out those few seconds of Marty bliss to a full minute and a half! All-out attackers often believe that they have to attack all out. It's the death of many a game. While it's true that a strong attacker should attack most of the time, there's one time where they shouldn't look to always attack - when receiving. If they can only attack the serve, while the opponent has more variation, then, all things being equal, they are toast. Instead of blindly attacking every serve, an "all-out attacker" should mix in subtle returns, such as short pushes and sudden quick ones. This keeps the opponent off guard, and so when the attacker does attack the serve, it's far more effective. At the highest levels, the top players are great at mixing in flips and short pushes to mess up opponents. Players at all levels from intermediate up should learn to do return serves with such variation. If you are an all-out attacker, then you use the receive to disarm the opponent, and look to attack (or counter-attack) the next ball. If you always attack the serve, then the server knows the ball is coming out to him, and can hang back waiting for the aggressive receive. This, combined with your missing by being so aggressive, gives him a tactical advantage. However, if the receiver's not sure if you are going to attack the ball, push it back heavy (so he has to drop down to loop) or drop it short (so he can't hang back and wait for your shot), he's going to have trouble reacting to your receive. If you can hide what you are going to do until the last second, and perhaps change directions at the last second as well, it will further mess up the poor server and set you up to attack the next ball. Ironically, I'm one of the great offenders of this "don't attack every serve" rule - but only when I play hardbat. When I use sponge, I mostly use control to receive while mixing in aggressive returns. When I play hardbat, I attack nearly every serve, hoping to set up my forehand on the next ball. I do so both because I don't play enough hardbat to have the control to finesse the serve back, and because if I don't attack the serve it leaves my overly-weak hardbat backhand open to attack. (In sponge I have a steady backhand; in hardbat my backhand is awful, and so I usually chop backhands while hitting all-out on the forehand.) Also, in hardbat, if I attack the serve I don't have ot worry about a sponge counter-hit; it's much harder to do that with hardbat. I mention my hardbat game because I'm off to defend my hardbat titles at the Cary Cup from 2010 and 2011. Hopefully my overly aggressive receives won't make me "toast"! It's also important not to return every serve defensively. Sometimes be aggressive, sometimes use control. Variety messes up an opponent. Predictability does not. DONE!!! Yes, all 460 pages and 837 photos are done and sent to the printer as PDFs. Now I get a day to rest before leaving for Cary. Wait . . . did I say rest? Today I tutor calculus for two hours (I do that once a week), coach table tennis two hours, and do my taxes. Meanwhile, Tim Boggan has already found a number of items that need to be changed. On Monday, after the Cary Cup, I get to input the new changes and send new PDFs to the printer. Here's a nice selection (8:49). I vaguely remember some of these shots, and there's a chance I posted this video before, but it's worth watching again. Talk show host and actor/comedian Chris Gethard shows up, plays, and videos a table tennis tournament for his show, "The Chris Gethard Show" (2:03). The video (1:40) is about the transfer of energy and, indirectly, whether or not the flooring under a table affects play.